I obtained this newspaper after flying to Birmingham, Alabama to witness this historic trial. While only there a few days, I was blessed to be there for the rendering of the verdict of “Guilty”; an unforgettable moment. I had a brief conversation with Blanton during a recess, but the conversation was interrupted by his attorney. Defendant: Thomas E. Blanton, Jr. SIGNIFICANCE: The bombing deaths of four black girls in a Birmingham, Alabama, church in 1963 brought additional support for the civil rights movement, and was a catalyst for the passage of the Civil Rights Act of 1964, but Thomas Blanton was not tried for the murders until 38 years after the event. On the morning of Sunday, September 15, 1963, a bomb placed under an outside stairway of the 16th Street Baptist Church in Birmingham, Alabama, was detonated as the congregation inside prepared for services. The blast killed four girls who were in the basement of the church: Carole Robertson, Cynthia Wesley, and Addie Mae Collins, all age 14, and Denise McNair, age 11. Many others, including relatives of the girls, were severely injured. Birmingham had become a center of civil rights activities and protests in the early 1960s, and the 16th Street Baptist Church was known to be a place where young activists gathered. The attack occurred just months after Birmingham gained international notoriety as a result of news coverage showing the police using attack dogs and water cannons against civil rights marchers led by Martin Luther King, Jr. Within a few weeks investigators from the Federal Bureau of Investigation (FBI) had identified four members of local Ku Klux Klan groups as suspects. They were Robert Chambliss, known as “Dynamite Bob,” and thought to be the ringleader, Thomas E. Blanton, Herman Cash, and Bobby Frank Cherry. Using electronic surveillance and assisted by a Klan member, Mitchell Burns, who had become a paid informant, the FBI gathered taped recordings of conversations among these men and their friends and families which implicated them in the bombing, and which would eventually provide the evidence crucial for the convictions. However, ignoring the express wishes of President John F. Kennedy, and subsequently President Lyndon B. Johnson, then-FBI director J. Edgar Hoover overrode his agents in the field and ordered that they not proceed with prosecutions, ostensibly on the grounds that the case was circumstantial, and it would not be possible to convict white men of killing blacks in Birmingham at the time. Hoover also ordered the records of the investigation to be sealed. In the mid-1970s, Alabama attorney general Bill Baxley was able to obtain FBI records pertaining to Robert Chambliss, and in 1977 Chambliss was convicted of murder in the bombing; he died in prison in 1985. Herman Cash died in 1994; he was never charged in the case. In 1993 Birmingham civic leaders persuaded the FBI to re-open the case, which resulted in the production of 9,000 tapes and documents collected by the FBI in the 1960s, only a portion of which had been seen by prosecutors in the Chambliss trial. 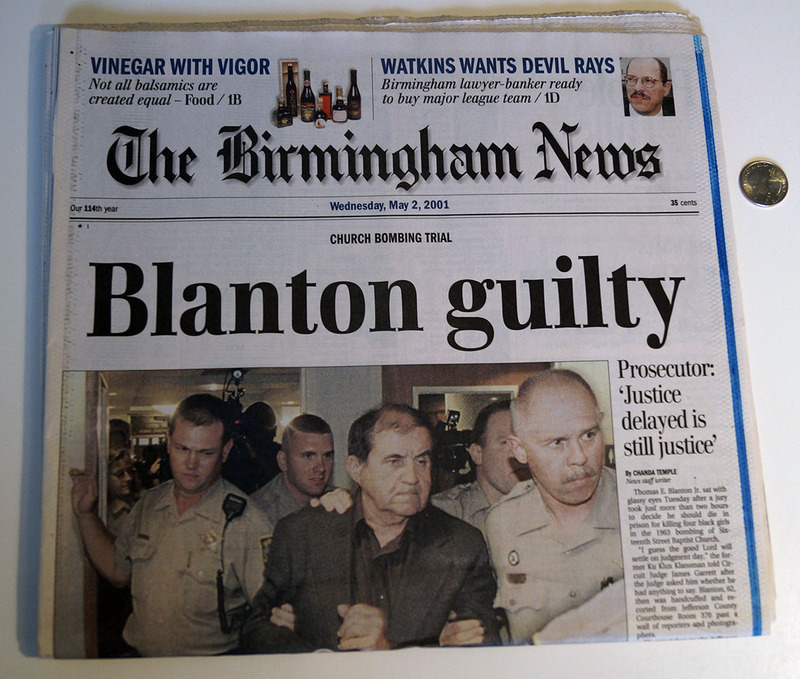 Several other successful prosecutions in the 1990s for acts committed against blacks and civil rights leaders decades earlier encouraged Birmingham leaders to press the case against Blanton and Cherry. These included the conviction in 1994 of Byron De La Beckwith for the assassination of Medgar Evers in 1963, and the conviction of former Klan imperial wizard Sam Bowers (see Price and Bowers trial) for the firebomb death of an NAACP leader in Mississippi in 1966. In May 2000 a Birmingham grand jury indicted Blanton and Cherry for the murder of the four girls killed in the 16th Street Baptist Church. Blanton and Cherry were scheduled to be tried together, but two weeks before the trial was set to begin Circuit Court judge James Garrett postponed the trial of Cherry indefinitely, following a psychiatric finding that he was not mentally competent to assist in his own defense. Jury selection began on April 15, 2001, and took a week. The panel chosen from an unusually large pool consisted of eight white women, two white men, three black women, and three black men. The prosecution faced, by its own acknowledgement, a difficult task, made so largely by the number of years that had elapsed since the bombing. One key witness who had earlier testified to seeing a car resembling Blanton’s Chevrolet near the church in the early hours of the morning of the bombing had died. Another witness who had testified to the grand jury that he had seen a man resembling Blanton carrying a black bag near the stairwell of the church at 1 a.m. on the morning of the blast had since suffered a stroke and was unable to give evidence. There was no physical evidence linking Blanton to the manufacture, transportation, or detonation of the bomb. On the first day of testimony the prosecution, led by Doug Jones, a U.S. attorney who had been deputized to prosecute the case in state court, presented numerous witnesses who were present at the time of the bombing. These witnesses included the mother of Denise McNair, who was teaching a Sunday school class, and the pastor, the Reverend John Cross, who described digging through the rubble to find the bodies of the girls. Other prosecution witnesses included the FBI agents who had interviewed Blanton after the bombing and who had investigated the case over the following months, the informant Mitchell Burns, and others who described the surveillance and secret taping of Blanton. Others testified to the virulence of Blanton’s segregationist views and to his involvement in Ku Klux Klan activities. On April 27 in a crowded courtroom the jurors first heard segments of the FBI tapes. Some were made on a tape recorder which the FBI had placed in the trunk of Burns’s car; others were obtained by the use of a microphone implanted in a wall of the kitchen of Blanton’s apartment by FBI technicians, who, posing as truck drivers, had rented the adjoining unit. The defense was unsuccessful in seeking to prevent the playing of the tapes, which were made in 1964 and 1965 before Congress restricted such secret taping without a court order. In crucial sections of the tapes Blanton tells Burns that the bombing of the 16th St. Church “wasn’t easy,” and in a conversation with his then-wife, Blanton talks of going to a meeting “to plan the bomb.” However, at no time did Blanton explicitly admit to having carried out the bombing, and Mitchell Burns acknowledged under cross-examination that in none of the many conversations he had had with Blanton had he ever done so. A court-appointed attorney, John C. Robbins, represented Blanton. In his statements to the jury Robbins acknowledged Blanton’s racist views, but exhorted jurors not to be influenced by the historical significance of the bombing, or by the emotional testimony of eyewitnesses. He reiterated that the prosecution’s case was entirely circumstantial, and that there was no evidence proving that his client was responsible for the bombing. During cross-examination Robbins was able to expose flaws in the memories of some witnesses, and to cast some doubt on the reliability and credibility of others. Blanton did not testify, and the defense called only two witnesses. The trial lasted only a little over a week, and the case went to the jury on May 1. They deliberated for only a little over two hours before returning a verdict of guilty on all four counts. Jurors subsequently acknowledged that the FBI tapes were the evidence that led them to convict. Thomas Blanton was sentenced to a term of life imprisonment for each of the four murders. The photograph of Thomas E. Blanton Jr. in last Thursday’s Times came as a shock. The last time I saw Tommy Blanton, one of two former Ku Klux Klansmen jailed in Alabama last week, he had the chunky look and some of the swagger of a honky-tonk tough. But his appearance, at 61, is indisputably that of a puffy old man. It was a big change from 18 years ago when I interviewed Mr. Blanton about his alleged role in the bombing of the 16th Street Baptist Church, where four children died on Sept. 15, 1963. We met in a coffee shop near the University of Alabama in Birmingham. As I expected, he denied any knowledge of the bombing. He even feigned a lack of interest in the entire subject. But he perked right up when I mentioned that I had been in touch with Robert E. Chambliss, who was in prison near Montgomery. Then Mr. Blanton became the questioner. Had Mr. Chambliss mentioned him? he asked. I, of course, understood the source of Mr. Blanton’s sudden curiosity. As long as ”Dynamite Bob” Chambliss remained silent, his old friends were safe from implication in the crime for which Mr. Chambliss was convicted of murder in 1977. It is the fate of men who belonged to Eastview Klavern 13, the most violent urban Klan unit in American history, to fear voices from the past. Mr. Chambliss is dead now, but someone from the past has been talking. That is why Mr. Blanton and Bobby Frank Cherry, now 69, are in solitary confinement in the Jefferson County jail, both charged with multiple counts of murder. A jury will decide the question of their guilt, but we know the probable outlines of the case against them from testimony in the Chambliss trial and from Federal Bureau of Investigation files. Citing informants who claimed eyewitness knowledge of the area around the church, F.B.I. documents asserted that ”the bombing was the handiwork of Robert E. Chambliss, Bobby Frank Cherry, Herman Frank Cash, Thomas E. Blanton, Jr. and probably Troy Ingram.” Mr. Cash and Mr. Ingram, who was suspected of building the delayed-trigger bomb, are dead. Mr. Chambliss died in prison in 1985 after turning aside opportunities to get a reduced sentence in exchange for testimony against other suspects. When I talked to Mr. Blanton almost two decades ago, he was cagey enough to worry that Dynamite Bob might be tempted by offers of clemency. What he didn’t know was that the hate-filled old man was delusional. Mr. Chambliss thought, for example, that Gov. George Wallace would eventually pardon him. He also believed that Tommy Blanton was going to use a night-school law degree to mount legal appeals that would lead to Mr. Chambliss’s freedom. Mr. Blanton did have some legal interests. At one point, he hired a lawyer for the impossible task of getting his name expunged from F.B.I. files. That would have been a mountainous task, for Eastview Klavern 13 was riddled with paid and volunteer informants who had a lot to tell about Mr. Blanton, Mr. Cherry, Mr. Chambliss and the ”action squad” that carried out acts of racial violence. Many of those informants are dead now, meaning that Doug Jones, the energetic United States attorney who secured the new indictments, will have to build a mosaic of evidence from relatives and associates of the two men or from eyewitnesses who have not testified before. We already know from news accounts that Mr. Cherry’s former wife is likely to come forward and report on what she says Mr. Cherry said about the bomb: ”I lit it.” As a longtime student of the case, I will be interested to see who else appears at the new trials. In the past, investigators have gotten inconclusive statements from Mr. Blanton’s former wife as to his whereabouts on Sept. 15. Changes in her testimony could be extremely damaging to him, especially since other witnesses have placed Mr. Blanton’s car outside the church about eight hours before it blew up during Sunday services. The question of who testifies in these old cases is a fascinating one. Bill Baxley, the Alabama attorney general who prosecuted Mr. Chambliss, says that information from abused wives and girlfriends is a ”common thread” in Klan cases. A black witness who had been afraid to testify in the 1960’s was also critical in the Chambliss trial. But predictions that aging Klansmen would eventually want to purge their consciences have proved wrong. In the heyday of Klavern 13, back in 1963, Mr. Blanton and Mr. Cherry were proud to be known as the hardest of a hard-core lot in the heart of Dixie. By the end of 2000, we will hear the testimony of other citizens willing to prove that old times there are not forgotten.